Because every time I come across a story like this, it's as if the Ministry of Information has decided, once again, to disappear history. But I'm not about to let that happen -- and if it means I have to keep coming back and repeating the timeline below, I will. I posted the first version of this back in 2016. And I will keep updating it so that no one can make the claim that teachers and other public employees haven't already made large sacrifices in an effort to bring New Jersey back to fiscal health. 1995: Governor Jim Florio begins the modern era of New Jersey pension underfunding. 1997: Governor Christie Todd Whitman essentially pays for tax cuts by underfunding the pensions. 2001: Governor Donald DiFrancesco raises pension benefits, but he does so by using the same sort of revaluation tactics that Florio and Whitman had used. 2004: Teachers' mandatory contribution to the pension, which had been as low as 3 percent, is raised to 5 percent. 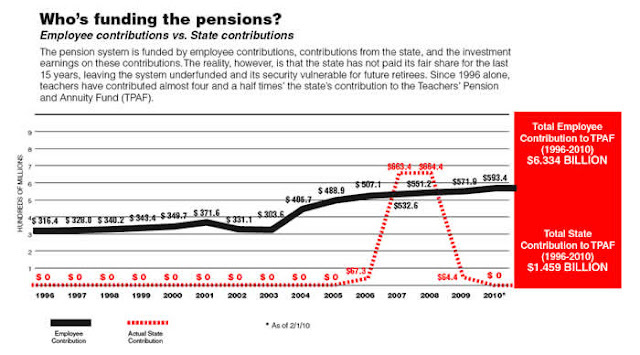 2007: By now, everyone (except Chris Christie) knows the pensions are in trouble and have to be fixed. Under Governor Jon Corzine, teachers and state workers now pay 5.5 percent into their pensions and see the retirement age go up 5 years. In addition, state workers now pay 1.5 percent of their income for health benefits. These increases are part of an explicit deal: in exchange for these concessions the state will start making payments into the pension system. Those payments, however, last for only two years. 2008: The state raises the retirement age again. 2010: Governor Chris Christie makes significant changes to the pension for all new hires, and now requires all current school district employees to pay 1.5 percent of their salaries toward health benefits. At this time, a report is released from Labor and Employment Relations Professor Jeffrey Keefe of Rutgers University that shows: "... full-time state and local employees are under-compensated by 5.88% in New Jersey, in comparison to otherwise similar private-sector workers." The plan for increased worker contributions is phased in over four years. At the end, in 2015, workers pay 25% more to get 30% less pension. Workers are required to pay an increasing amount of the health care premium, with a top rate of 35% of premium for the highest earners. The state budget includes a 1/7th payment for FY12. Christie makes the payment on the final day of the fiscal year, in June 2012. In response to the 2010 Supreme Court ruling, the legislature creates a contractual right to the funding of the pension. In addition, cost of living adjustments (COLAs) are frozen under the new law. 2013: During the gubernatorial election, no one in the press cares to ask either Chris Christie or his opponent, Barbara Buono, how they plan to raise the revenues for a full pension payment by 2017. 2014: To the surprise of no one sentient, Christie refuses to make the payments his own law requires. Meanwhile, reports begin to surface about inordinately high management fees paid to Wall Street firms linked to Christie. The unions file suit. Today, however, while the cost of New Jersey public employee health insurance coverage remains the third-highest in the nation, most New Jersey public employees are paying more than the national average for state government workers toward their health insurance costs, an NJ Spotlight analysis shows. Meanwhile, New Jersey's public employee pensions have devolved into one of the least generous in the nation, according to a New Jersey Policy Perspective analysis. And yet the state's highest court rules New Jersey doesn't have to fund the pensions, and can instead set the state up for a looming fiscal disaster. As the sun sets on Chapter 78, boards need to remember three important points. Once, employee contributions become negotiable, boards need to carefully consider the long term implications of moving away from the cost structure dictated by Chapter 78. At the same time, Chris Christie's pension commission releases a report calling for public workers to be moved into less generous health care plans, requiring much greater out-of-pocket expenses. In June, the NJ Supreme Court upholds the frozen COLAs on pensions. Late in the year, NJEA, the state's largest teachers union, reports the teachers pension has a funding level of 47 percent. The level must be 80 percent to reinstate the COLA. 2018: NJEA agrees to changes in health coverage that reduce costs by raising the prices for out-of-network coverage. Meanwhile, reports continue to surface about high health care costs for New Jersey's teachers. On July 1, the final pension rate hike under Chapter 78 is implemented: teachers now pay 7.5 percent of their salaries toward their pensions. The Office of the State Comptroller reviewed several of the state’s tax-break programs aimed at rewarding companies for either creating or retaining jobs in New Jersey over the last decade. The agency gave closest scrutiny to a sample group of a few dozen companies that were awarded incentives, and it found nearly 3,000 reported jobs were not substantiated as having been created or retained even though the companies in that group redeemed their incentives. Pensions: Payments have gone up from 5 to 7.5 percent, the COLA is still frozen, and the pension is judged to be one of the least generous in the nation. Health insurance: Both the premium and the percentage employees pay has skyrocketed. Again, public employees are paying more than private employees for individual coverage, and not much less for family coverage. Wages: By all indications, teachers continue to suffer from a wage penalty. In addition, while teacher salaries are growing slightly in the state, the growth appears to be nowhere near enough to make up for the losses from pension and health care contributions. By any reasonable measure, New Jersey teachers -- and other public employees -- pay more for their retirement and health care benefits, get less back for those pay hikes, and still lag behind the private sector in total compensation. This is beyond debate. Even as the state gave away billions in tax incentives that haven't been shown to do anything, teachers and other public employees have sacrificed -- over and over again -- to get New Jersey back to fiscal health. Then why is this even a thing? The aide — Deborah Cornavaca, Murphy’s deputy chief of staff for outreach — said during the call Wednesday that Sweeney, a fellow Democrat but frequent Murphy rival, is pushing “a false narrative” against public-worker unions. Sweeney, D-Gloucester, told NJ Advance Media he’s bothered by Cornavaca’s appearance on the call. “You can imagine how disappointed I am that a deputy chief of staff is calling groups to basically attack,” Sweeney said Thursday. A disclaimer first: I've known Deb Cornavaca for a good long while. I wouldn't say we were close friends, but we've shared a few meals over the years and I like her a lot. She's smart and tough and doesn't back down from a fight. Yes, there is a lot of bad blood between Sweeney and the NJEA. But I listened to this town hall and I didn't hear Deb tell anyone to go after Sweeney personally. Instead, I heard her tell activists -- people who work to protect the interests of middle-class public workers like me and many of my readers -- to push back on the story that it is up to teachers and cops and firefighters and state workers to fix New Jersey's fiscal mess. Look at my timeline above again. Can anyone really make an argument that New Jersey's public workers haven't been doing their fair share -- in fact, way more than that -- to solve the state's budget crisis? Is it wrong to say to those who keep demanding more and more from public workers that it's past time for other interests to start pitching in as well? The sacrifices of New Jersey's teachers are laid out above. Where, however, are the sacrifices of the wealthiest people in the state? The small hike on income over $5 million imposed last year? The temporary corporate surcharge? Is anyone prepared to argue that those are at all comparable to what I've outlined above? Especially since New Jersey corporations have been enjoying huge tax incentives with no accountability? I will admit that New Jersey is better than most states when it comes to tax fairness, but we're hardly progressive. 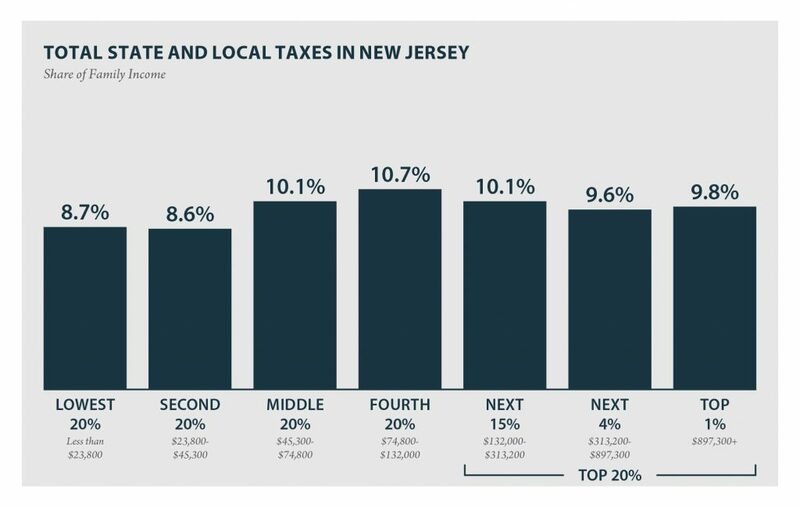 The top 1 percent in New Jersey make family incomes of over $900,000 a year, and they pay less in taxes than people who have incomes in the middle -- people like teachers and the vast majority of public employees. Is anyone seriously suggesting the state's wealthiest folks can't put in some more to help New Jersey out of this mess, especially since public workers have been putting in more and more for years. And what has been done to rein in the excessive fees collected by Wall Street to manage the pension funds under Christie? What has been done to bring the cost of public employee health care down? Where are the tough negotiations with the pharmaceutical companies and big health insurers? What Deb was talking about in that meeting wasn't just about pushing back on a narrative -- it was about telling the truth. New Jersey's teachers and public employees have already made significant sacrifices to help the state out of its fiscal crunch. It can't always fall to us to be the ones to fix a mess we didn't create. We can't be the only ones who are expected to ask our families once again to make even more sacrifices while plenty of others in the state enjoy tax giveaways. I'm sorry that Senator Sweeney's feelings are bruised, but there's no way he should expect, given the history I've outlined above, that public employees are just going to keep taking it and taking it and taking it. Unless and until New Jersey starts demanding more from its wealthiest residents and corporations, public employees have every right to point at everything they've already given up and say: "Enough." Thanks for this, I wish it could be posted on NJ Spotlight or one of NJ's big papers. I am so sick and tired of teachers and other public workers being portrayed as villains and greedy pigs by political hacks like Christie and Sweeney. It's called divide and conquer and sadly it is working; so many ordinary people fall for the anti-teacher propaganda and think that teachers are stealing their money. Very discouraging for this retired teacher (bye, bye COLA). As for health care, if we lived in a sane country, we would already have Medicare for all, single payer or some form or version of universal health care like all the other wealthy industrialized democracies (Sweden, Australia, Japan, Taiwan, Canada, the UK, France, Israel, etc.). Thank you, Mark. No one could have said this better. Educators & other public employees must not back down from this fight. I'll be sharing this with my Republican reps! Thanks for the great overview. 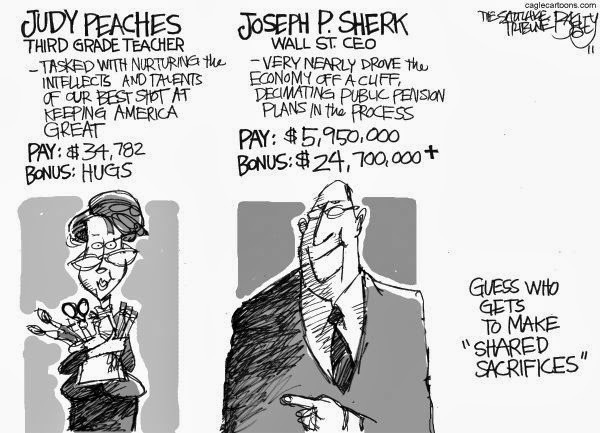 Thank you for the reminder that teachers are tax payers too! I am going to share this. Thank you for your diligent and detailed work on this piece. Has anyone researched the number of teachers who went into either bankruptcy or foreclosure as a direct result of the steep increases in contributions to pensions and health insurance? I work in a high school of about 800 students, and in my building alone I know of 5 teachers who did just that. Can you please add the history of sick day payouts/ private disability to this?